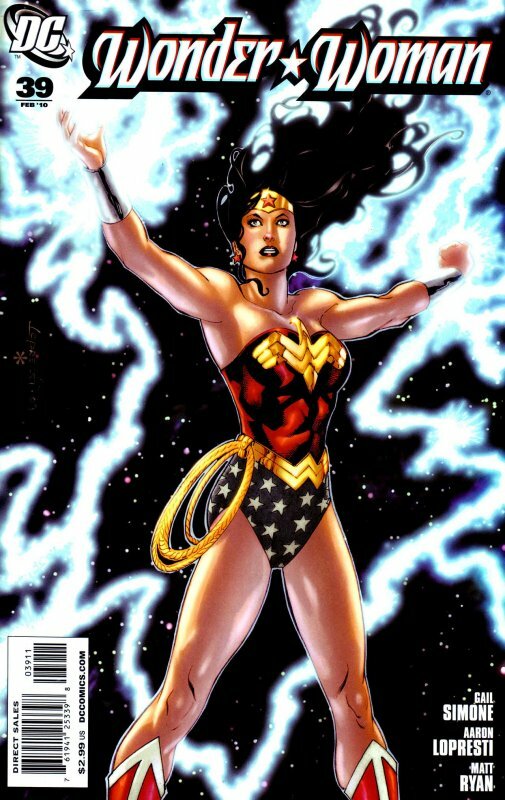 Diana learns that her new power she inadvertently used in issue 34 was courtesy of Zeus. Meanwhile Alkyone watches in satisfaction as Diana is carried aloft by the multitude of arms belonging to the creature Cottus. She screams up at the struggling Amazon Princess that she has only ever wanted to save the Amazons and that she has made terrible choices to achieve her goals. 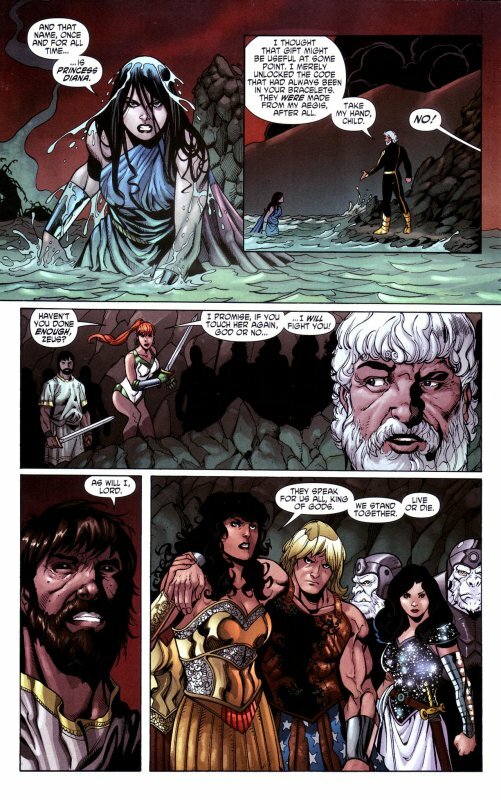 She has only ever wanted Hippolyta to rule the Amazons and for her faithful Circle to watch over them. Diana yells back that she had killed Phinea as a blood sacrifice to summon this creature and Alkyone says she would kill a hundred Amazons if need be – if it means the end of the “Dragon”. Jason and Artemis watch rooted to the spot as Cottus takes Diana beneath the waves. For his part, Achilles launches an enraged attack on the Circle but Alkyone hurls Athena’s spear and it pierces his heart! He sags to his knees as Alkyone stands over him and coldly says that she would never let him command over her people, “husband”. Jason cries out in horror and together he and Artemis lead the Amazons and Olympians on a charge across the bridge towards where Alkyone and her sisters stand waiting, ready for the final battle. Down in the ocean below Diana continues to struggle as Cottus drags her deeper and deeper into the gloomy depths. It tells her how on the night of Diana’s creation, Hippolyta had removed the clay from the earth. 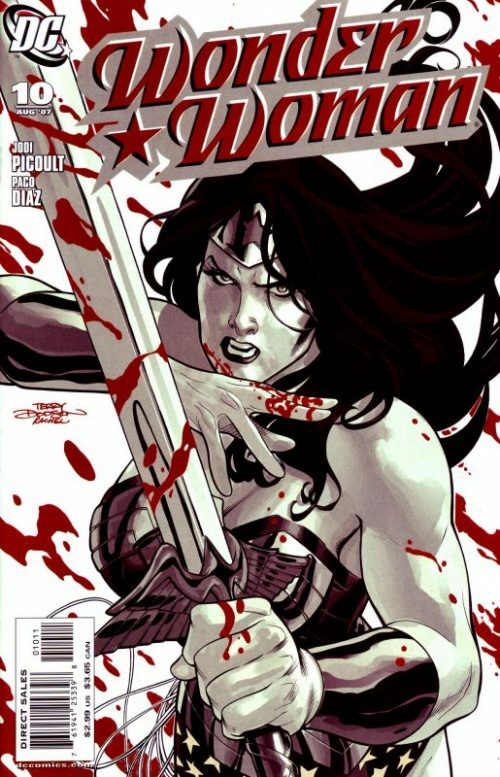 “I watched as she scraped the clay from the walls of my home under Themyscira…clay rich with the essence of my being, the skin of my own life. It helped make you strong and fierce but it belonged to me!”. Back above Alkyone prepare for their deaths as the stampede of Amazons and Olympians approach but instead watch in surprise as their attackers run past them and dive into the ocean, intent on saving Diana. As she too dives in, Artemis tells her new comrade in arms Jason that it is an honour to die with him today. Below, Diana ponders the words of Cottus. Can this creature really be a part of her? “No” I won’t believe it!”. With new determination she rips away his limbs, trying to break free and it tells her to cease her struggle and return to him. “Cease my struggle? You must not really know me at all creature” she thinks. Meanwhile Alkyone watches bemused as the Amazons and Olympians risk their life to save the Amazon Princess. Her circle turn to her and for a moment show doubt. “Alkyone, could we have been wrong about her? They all love her so. More than their own lives.” But Alkyone is not convinced. She tells them that there is no place here for them now. They must take Hippolyta and and start again afresh some place else. 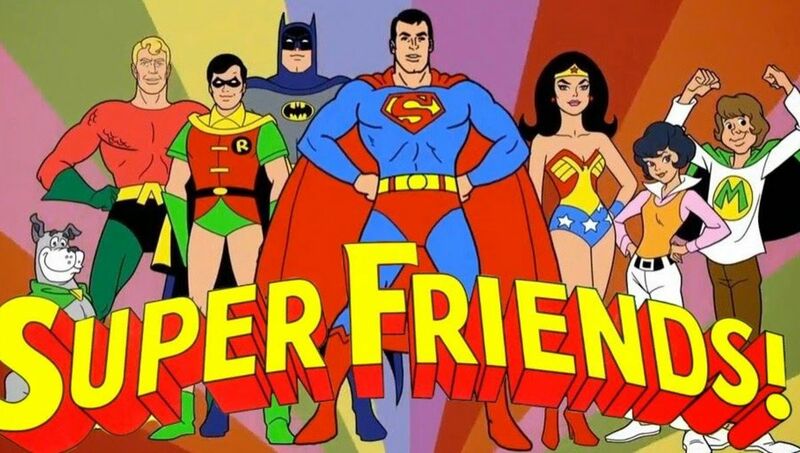 As she leads them off to take collect the Queen and kill their other remaining prisoners, Phillipus and the Gorillas, they find their way blocked by Achilles. He removes the spear from his body and charges at them in rage, reminding them that he has the heart of a God! Down in the waters below, Diana can see her sisters and allies swimming down towards her. They use their swords to try and hack away the limbs holding Diana but more instantly grow back. Diana knows that she cannot stay underwater for ever and needs air…and something else. Suddenly from the gloom one of the Megalodons swims up to her, mouth agape. She removes the gift it brings…her golden lasso that it has retrieved from the ocean floor. She uses it to ensnare the Cottus and then zooms up out of the water, hauling the creature behind her. “Now we fight in my element” she smiles. Further inland meanwhile, Zeus watches events unfold and hears a voice behind him say “Not quite the protection of these people you promised me, Lord Zeus, is it?”. He turns to see an Amazon, now possessed by the Goddess Athena, standing there. He tells her he is glad of her company in his hour of failure. He explains that after the Olympian Gods had been kidnapped by Granny Goodness (See Infinite Crisis), they had endured endless torture and suffering at the hands of Darkseid’s minions. Bereft of their gifts and their courage, except the ability to heal. So that each day they were refreshed to be tormented anew. Zeus had never felt so mortal. He had lost himself and his pride was incinerated. The Gods had been brought low and finally tossed out as refuge. They had been dying in body and soul until the Ichor arrived and had taken them in. These judges and saviors of Gods of all worlds gave them the soul suits that slowly rebuilt their bodies and healed their hearts. This allowed Zeus to think again and feel regret for the first time in thousands of years. Elsewhere Achilles battles Alkyone and her circle. She manages to clash his chest with her sword and he clutches his wound in agony, surprised at the pain. “What have you done to me” he croaks. Alkyone replies that her sword has been tipped with the poison of decay, made from the tears of Medusa. “You should feel honoured to die this way” she crows. 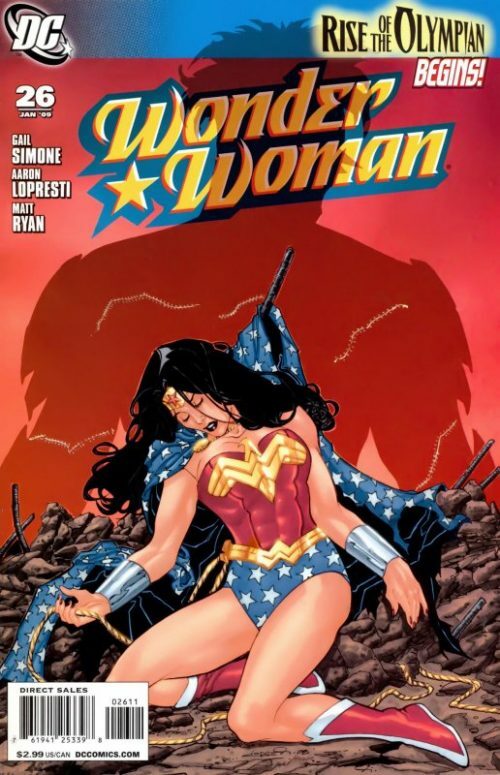 “He will not die today Alkyone” says Hippolyta’s voice and as Alkyone turns around in surprise to cry out “But we did this in your name” she is struck by a volley of arrows fired by the Amazon Queen. 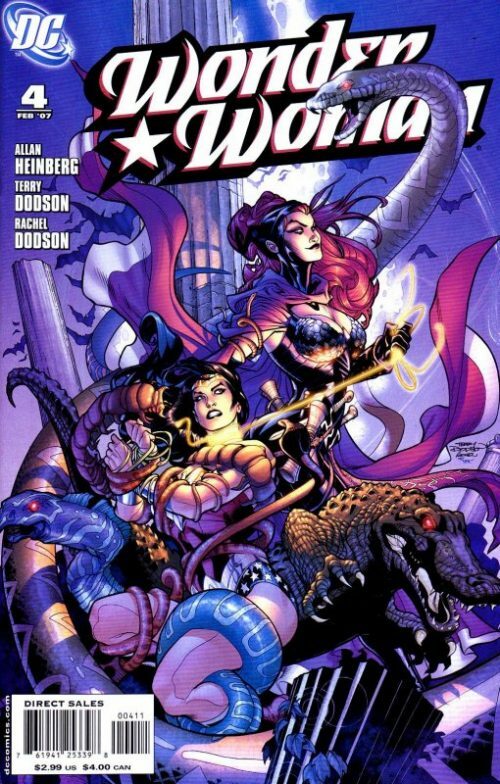 Hippolyta, flanked by Phillipus, Donna Troy and the remaining Gorillas, watches Alkyone crumple to the ground. Above, Diana continues to battle the Cottus. It says that she can amputate its limbs and it will simply grow more…she can tear her flesh and its acid blood burns hers in return. Diana acknowledges the creature’s strength but knows that she has some assets of her own. Her allies below, both old and new…as well as the eyes of Artemis the Hunter , the Speed of Hermes and the stubbornness of the Amazon race! As Alkyone’s sisters crows around her dying body and Achilles makes a run for it from the bridge, Diana forces the Cottus down onto the altar, smashing it apart and sending Alkyone and her circle crashing down into the waves below. 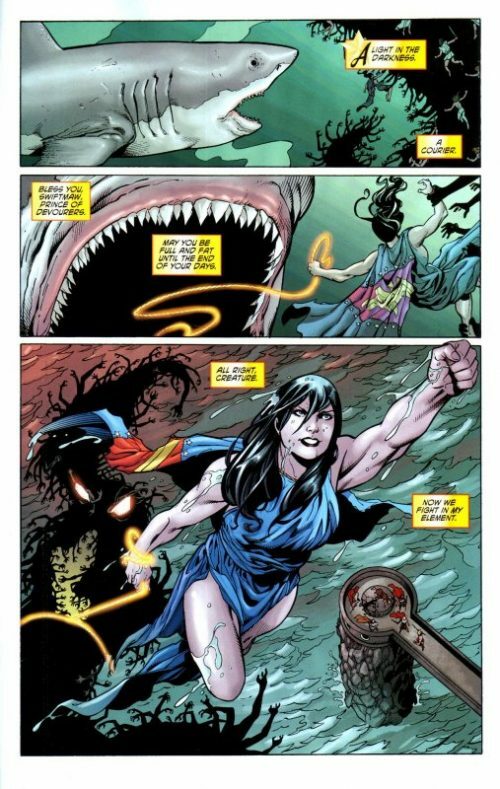 Diana dives into the ocean and retrieves her bracelets from the body of Alkyone before smashing them together and summoning the lightning of Zeus. Instantly lightning forks from the skies and incinerates the Cottus. Diana emerges from the waves and onto the beach where she is met by Zeus. He tells her that he thought the gift of lightning might be useful. 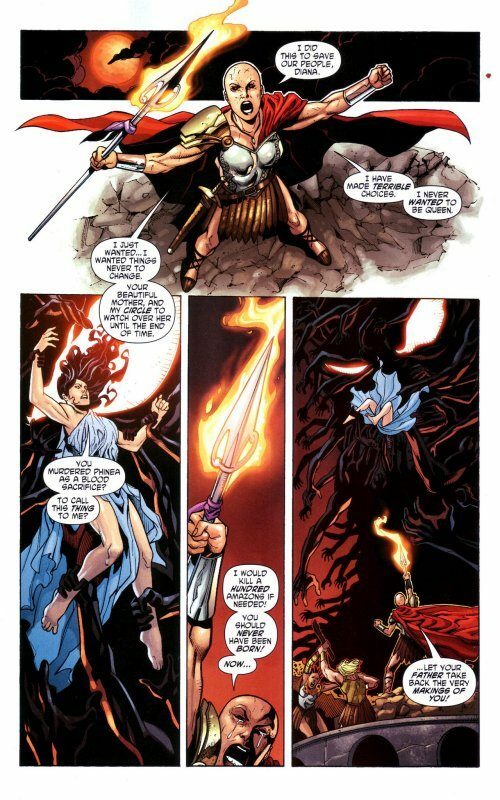 He merely unlocked the code that had always been in her bracelets which had been made from his Aegis.He then tries to offer Diana his hand but Artemis cries out “no” and says that if he touches her again, then God or no God she will fight him herself. 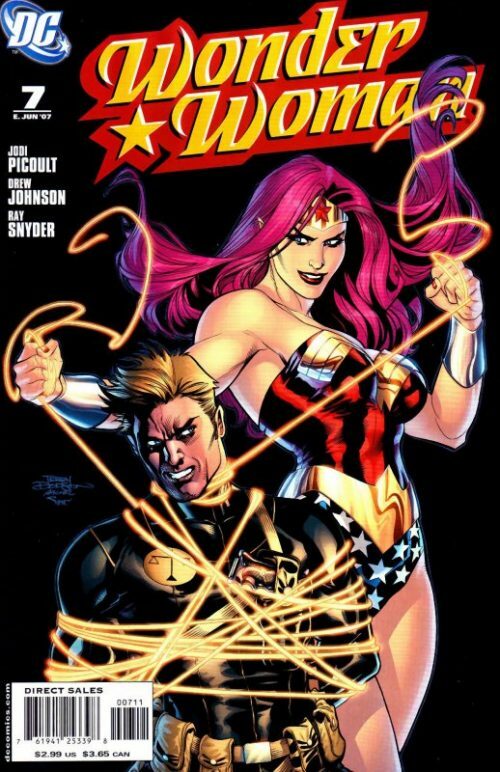 Jason concurs and so does Hippolyta and all the other Amazons and Olympians, including the weakened Achilles who the Amazon Queen is helping to stand on his feet. Zeus puts his head in his hands and replies that he is old and cannot do the task that was appointed to him by the Ichor. He then explains that when the Gods had ben traveling back to Earth with their Ichor saviors, they had wanted him to choose the most worthy among his people to join them…to be something greater than a god. He had thought it would be Achilles but he now realises it should have been Diana all along. She had united the Amazons and the Olympians when Zeus could not – and had conquered every trial. He places a gentle hand on her cheek and she replies that she cannot accept his request. Only moments ago she had rediscovered her place on this island. He smiles and says that she need say no more. Perhaps a suitable replacement can be found yet. He then leans forward and says he has something to tell her. “Be joyful. You have earned it. And thank you for reminding me what it means to do the right thing.” With that he disappears. Hippolyta then runs across and mother and daughter warmly hug each other. The Amazon Queen asks for her daughter’s forgiveness and Diana replies that she cannot forgive what she has already forgotten. She then asks if the Cottus had really been her father? Hippolyta replies “Never! No more than the rain in the sky that night. 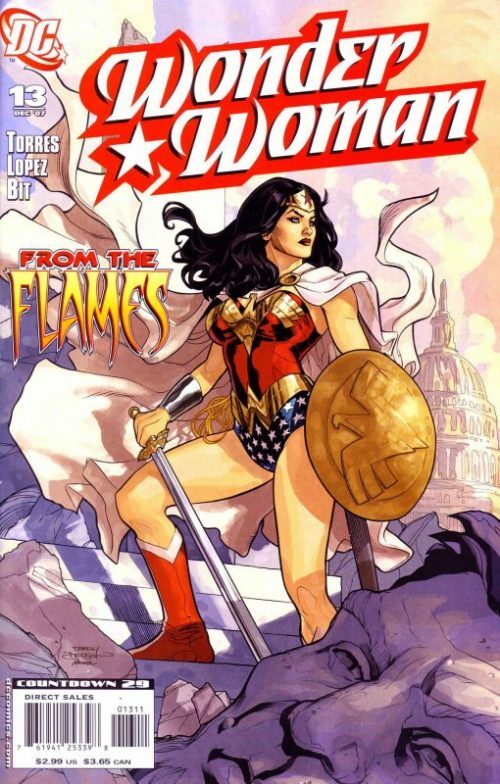 You are the daughter of the Amazons, Diana”.